Chelsea midfielder Cesc Fabregas has rejected suggestions of a bust-up with manager Antonio Conte. 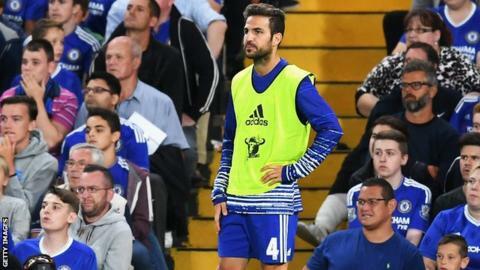 The manager was reported to be open to allowing 29-year-old Fabregas to leave before the transfer deadline. Fabregas, however, has posted on social media that the pair have a "good relationship" and that he is "fully committed" to the club. "Contrary to what has been written, the manager has never told me that I can leave," Fabregas wrote. "He said that he counts on me, as I count on him. I will continue to fight for this club until the very end and when called upon I will always give my very best. "I'm fully committed to Chelsea FC and my only goal is to help them win more trophies." The former Barcelona and Arsenal midfielder has made 97 appearances for Chelsea but was an unused substitute for their 3-0 Premier League win over Burnley on Saturday.